1.1. Registration is not necessary at www.mygoodknife.com. Customers can register, using the registration form, if want to. 1.2.By registering as a customer in MyGoodKnife, customer should give required information (name, address, email, phone number). 1.3. Customer declare that the given information is correct. 1.4. By registering as a customer in MyGoodKnife, customer agrees to receive news and notifications from shop. 2.1. By placing an order at www.mygoodknife.com, customer verifies that customer is over 18 years old. 15–18-year-old buyers require their guardian’s permission when buying a product with funds that they have not acquired through their own work. 2.2. 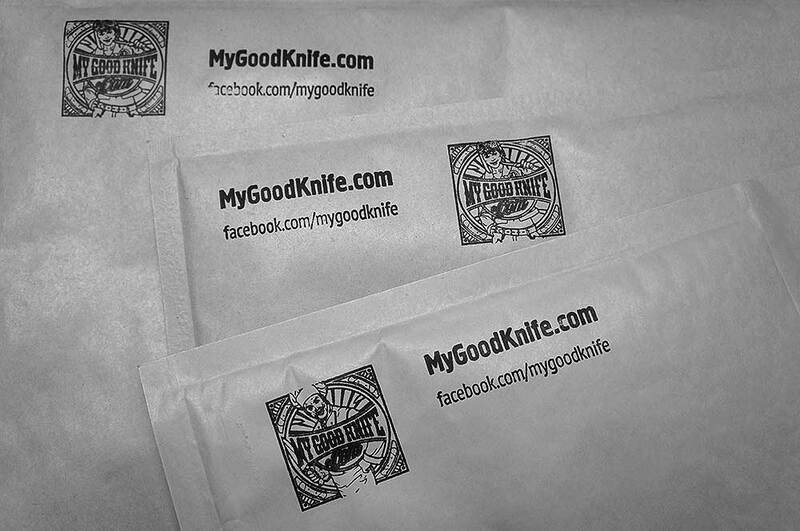 Placing an order at www.mygoodknife.com customer confirms, that aware of all local, state and federal laws regarding the possession or carrying of the ordering products. MyGoodKnife shall be held blameless for any infraction of laws by the purchaser. 2.3. Communication between the customer and MyGoodKnife shall occur either by e-mail, letter or telephone. After completing an order, customer get order confirmation be email. A binding sales contract will take effect after MyGoodKnife has sent to customer an order confirmation by e-mail. 2.4. Before the order has been delivered, the customer has the right to cancel the whole order, or parts of it, by e-mail, letter or phone. After customer’s getting email about shipping, cancelation of order is unable. 2.5 International orders are shipped at the customer’s risk. By placing an international order, the customer assumes all risk of confiscation en route. If customs should confiscate or return goods to MyGoodKnife, the customer is still responsible for all shipping charges including return shipping charges. If customs confiscate but do not return goods to MyGoodKnife, customer can’t count on payment return. 2.6 MyGoodKnife accepts payments only in euro. Prices in USD and RUB are shown only for customers approximate orientation. 3.1. The valid price is given in euros (EUR). MyGoodKnife reserves the right to make price changes. 3.2 In original, all prices include VAT 24%. Orders to countries, which are not members of European Union Customs Union (EUCU) ship without tax. Choose Non EU to see prices without tax. 4.1. MyGoodKnife ships worldwide, with the exception of countries, knive’s delivery to which is prohibited by international law. 4.2 Deliveries are carried by Finnish Post (www.posti.fi) in cooperation with official postal companies of country arriving and by GLS (https://gls-group.eu/FI/en/home#). 4.3. Shipping is available after 100% order prepayment. Tracking number of parcel will be send to customer after dispatching. The estimated time of dispatch shall be 1 working day. If in one order customer orders items, which are located in different stocks (Helsinki and Lappeenranta), estimated time of dispatch shall be 3-4 working days (time of delivery from one stock to other). 4.4. Parcels to Finland and Estonia can be shipped by SMARTPOST. 4.5. Orders placed after 14-00 Friday will be shipped on the following Monday. On weekends and public holidays shipping is not possible. 4.6. All the customs fees and taxes are solely the buyers’ responsibilities. MyGoodKnife always declares the real value and contents of parcels. 4.7. MyGoodKnife supports the international fight against fraud, so orders are not sent to the public mail boxes and to hotels. – Advance payment via a bank transfer. The customer will receive payment details for a bank transfer with their order confirmation. The amount to be paid is stated in the order confirmation sent by MyGoodKnife. The order is active within 10 days from the date of order. 5.2. If payment is not received by MyGoodKnife within 10 working days, order will be cancelled automatically. 6.2. Private customers from Euro Union have the right to return unused products within fourteen (14) days of receiving the product(s), starting the day after the receipt date. The returned product(s) and product packaging shall be in the same condition as when received. In that case payment will be refund to customer within 30 days after getting product back. Refunds do not include shipping costs. The product packaging shall be unbroken and the product shall have no signs of use. Customers have to pay return shipping cost. 6.3. If the product to be returned is no longer flawless (the product was used or damaged by customer) – payment will not be refunded to customer. All knives are checked by MyGoodKnife before shipping. If the package or the products ordered have been damaged in transit, a damage report should be filed immediately. Customer should inform local Post office about damage immediately. Also in that case inform MyGoodKnife’s custom service by email cs@mygoodknife.fi MyGoodKnife do not accept claims, if customer choose shipping without tracking. MyGoodKnife shall not be held responsible for any delays, failures to fulfil obligation or any other failures that occurred due to circumstances and obstacles that are beyond our reasonable control, which include but are not limited to strikes, governmental actions, wars or national emergencies, terrorism threats or acts of terrorism, environmental or climatic anomalies, failure of performance by a third party, internet connection issues as well as hardware and software malfunction, other corresponding event beyond MyGoodKnife’s control. 9.1. Finnish law will be applied to any disputes or disagreements resulting from this Distance Sale Contract. 9.2. Any unarbitrated disputes shall be solved in the Lappeenranta District Court. 10.1. MyGoodKnife is secured with SSL (Secure Socket Layer) certificate by Thawte. MyGoodKnife webshop is encrypted with 128-bit SSL protection. So customer’s personal data and payment transaction is completely secure. 10.2. MyGoodKinife’s customer’s data is confidential. MyGoodKnife pledges not to divulge customer information to any other party than the company’s internal partners. All information and content, including photos – is the property of Lämmin Tuuli OY (MyGoodKnife) and protected by Finnish laws and international laws. Any complaints regarding the goods or services supplied should be made to cs@mygoodknife.fi or any other contact detail provided under contact information. Our business hours are from Monday to Friday 09:00 – 17:00 Finland time. Statutory Rights: These Terms and Conditions do not affect any of your statutory rights.